George Graham Reviews Ben Vaughn's "Designs in Music"
There have been virtually no instrumental pop music hits in decades. But things were different in the 1960s. While rock music was dominating the charts, there was also a kind of countervailing force of light instrumental tunes that became considerable hits, from Percy Faith's "Theme from a Summer Place" to Mason Williams' "Classical Gas" to the Hugo Montenegro's version of the Ennio Morricone theme for film The Good, The Bad and the Ugly," as well as several from Herb Alpert and the Tijuana Brass. And there were some rock instrumental hits from the Ventures and the surf groups. Also in the early 1960s, when stereo hi-fi sound was still new, a lot of instrumental recordings were made to take advantage of the technology, many of them bordering on novelty recordings under names like "exotic sounds," and by such artists as Martin Denny and Esquivel. At the same time, film scoring began to include rock elements, such as electric guitars, after previously being based on classical orchestral music since the early days of motion pictures. And that led to a whole new genre that created what are now classic scores and styles that have come to evoke certain images in people's mind just from the sound. All of this ties in with a fun new album of instrumental music created by Ben Vaughn. It bears the wonderfully typical early 1960s record album title, Designs in Music. And it's a blast with 12 original tunes that will immediately take you to another time and plop you right in the middle of some imaginary movies from the 1960s, including what might be detective films, romantic comedies, spy thrillers, spaghetti Westerns, and perhaps a teenage monster movie or two. Vaughn conjures the styles of Ennio Morricone, Henry Mancini, Lalo Schifrin, who created the original music for the "Mission Impossible" TV series, John Barry, who did the first James Bond films, French composer Serge Gainsbourg and even Juan Garcia Esquivel, who created the wacky super stereo music with goofy combinations of instruments popping up right and left. Ben Vaughn has always been an interesting figure in his more than 20-year recording career, marked by a combination of cleverness and creativity but with tongue almost always placed in cheek. Originally from New Jersey just across from Philadelphia, he says his life was changed when at age 6, his uncle gave him a record by Duane Eddy, "the king of twang guitar" as he was known. In 1983, he formed the Ben Vaughn Combo, which was together for five years and released two albums that got lots of positive reviews and combined a kind of rockabilly sound with often wryly humorous lyrics. He continued a solo career that also involved a stint producing some albums of American Roots music by artists like Charlie Shavers. He also created one of the more distinctive concept albums, Rambler 65, which was recorded entirely in Vaughn's vintage automobile. In 1995, he moved to the Los Angeles area, and created his first album of non-vocal music called, appropriately enough Instrumental Stylings. That, and an appearance on the Los Angeles Public Radio Station KCRW led to his being hired as the composer for the commercial TV series "3rd Rock from the Sun." He also scores "That 70s Show", and has worked on "Grounded for Life," as well as composing for a number of independent films. So movie music is probably not far from Ben Vaughn's mind. But Designs in Music was also inspired by Vaughn's commuting between his home in the Mojave Desert and the Hollywood studios where he did his scoring. About the only radio station he could receive on the late-night drives was an old-fashioned easy listening station that played some of the instrumental pop of the early 1960s. The music worked is way further into his psyche, and led him to want to make a new recording in the style, though adding some contemporary influences -- just a few though. The result is a CD that's not only fun to listen to for its wonderful combination of vintage sounds, but also will provide amusement to almost everyone who has seen 1960s films, as you imagine the scenes that would go with the music. In Vaughn's typically witty manner, he can set up a mood evoking a classic film genre, and then take the piece off in an unexpected direction. He loves to create bridge sections in his compositions that go off on a tangent that sometimes can pop the mental picture you might be imagining from the music. This CD was largely created in three days with a number of Hollywood session players, who are used to doing movie cues, and they include horns and a whistling specialist, among others. Vaughn himself plays guitar in a kind of prototypical twangy sound, usually with the tremolo and reverb cranked up on his guitar amp, just like in the old days. Also prominent is Ryan Maynes who plays a variety of keyboards, using old-fashioned electric organ sounds, and instrumenyts like harpsichord, which was ubiquitous in the 1960s. Ben Vaughn has been doing his share of TV and film scores in recent years, but on his new CD Designs in Music he shows that he has not lost his sense of good humor and whimsy that has always marked his rock recordings. This CD is a combination tribute to 1960s film scores and the instrumental pop of the early part of that decade. It will bring a smile from anyone who remembers those films and the easy-listening mood music scene of yore. Vaughn nails the sound, hinting at plenty of the creative figures of that period, but definitely adding his own twist, especially in the way he can mix influences and sometimes throw in his own curious amalgam of different sounds. For a sonic grade, we'll give the CD an "A." The recording effectively captures the mood of the old-style sounds, but does not go overboard and try to match the sonic imperfections typical of the original recordings. The sound is clean and bright, and the quirky little details of Vaughn's music are well-rendered. 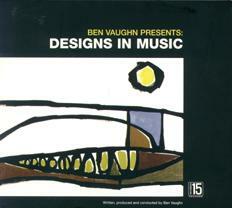 The formal title of this CD is Ben Vaughn Presents: Designs in Music. This is not the kind of recording that is likely to change the state of the world, but it is a lot of fun. I could see this as music for a party, where there could be lively discussions of what would be in the scene for each of Vaughn's selections. Or it's just fun music for when one wants to evoke a different, more lighthearted era.